The first season under head coach Lovie Smith provided moments of inspiration for the Illinois Fighting Illini but will likely go down as a disappointment as Illinois heads to Evanston Sunday to take on Northwestern. 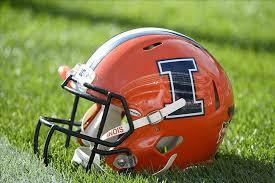 The Illini off a shutout loss to Iowa last Saturday (28-0) at Memorial Stadium, the 3-8 Illini will try to defeat their in-state rivals. Last year, the school announced an agreement to play the games when Illinois hosts Northwestern at Soldier Field in Chicago, but that was scratched earlier this season under first year athletic director Josh Whitman. Northwestern has had a rocky year. Starting the season 0-2, Northwestern lost to Western Michigan then FCS Illinois State. The Wildcats have beaten Iowa on the road this year. Northwestern is 5-6 on the season while Illinois is 3-8. Game time Saturday is 11 am and can be seen on the Big Ten Network.